And did you know that singing is also good for the heart? Singing can strengthen the immune system, reduce heart rate, live longer (!) and well, in fact there are quite a number of benefits on a physical, mental (especially if memorizing music), emotional, and social level. Rather than repeat all the various benefits, I will draw your attention to two websites: (1) http://www.moresingingplease.com/benefits-of-singing and (2) http://ideas.time.com/2013/08/16/singing-changes-your-brain/. You can choose to google others if you wish just by typing "benefits of singing." Do you enjoy singing and what do you enjoy most about it? Great post about singing, Elly. I agree about singing being therapeutic and they even say being involved with music can hold off dementia. I just love being involved in my women's choir. Our motto is that "Singing is Cheaper than therapy!" Our big concert is coming up soon. Too bad you're so far away or I'd invite you. I enjoyed watching you singing that duet of that mummer's song. Fun stuff! Glad you enjoy your choirs so much. I love to sing too and even had aspirations of becoming a professional singer at one time. That didn't happen, because the talent wasn't good enough, but I still sing in the shower, the car, around the house....Was never interested in joining any choirs or groups though. Not my thing. Good to know it can ward off dementia! I didn't realize all the physical benefits of singing. For sure I can see how singing can be good for the spirit. I know I always feel lifted when I sing. Great video of your duet. I would probably faint: I'm not good at being the center of attention... You did great! You take care now, Elly... Thanks! Lovely song and rendition :) Over the years, I have come to enjoy singing and realized how vast and important it is. When I was a child, I tried to learn from my mother (who has learnt for quite some years) but I never took it seriously so I have an action item now to learn it and enjoy it :) Thanks for sharing. Nice performance in the video. I like the style of music. I enjoy singing, but have gone in cycles with it. I have sung some duets in church in the past, but these days I don't sing much other than at home on occasion. Maybe I need to add some singing back into my regimen for health's sake. Join us on May 4 with your post of Reflections about this year's A to Z. 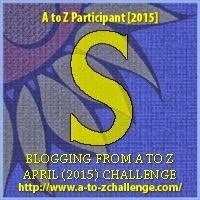 #A to Z Challenge: Z is for ...Zest! #A to Z Challenge: X is for ... Xpress! #A to Z Challenge: V is for ...Values! #A to Z Challenge: U is for ... Unique U! #A to Z Challenge: T is for ... Trust! #A to Z Challenge: P is for ... Poetry! #A to Z Challenge: J is for (Jumping for) JOY! #A to Z Challenge: I is for Inspiration! #A to Z Challenge: G is for ... Growth! #A to Z Challenge: E is for ... Emotions! #AtoZ Challenge: A is for ABUNDANCE!